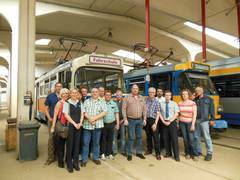 On the 22nd of May, Leipziger Aus- und Weiterbildungsbetriebe (LAB) and Leipziger Verkehrsbetriebe (LVB) organised the first Train-the-Trainer Workshop on eco-driving for tram driving instructors in Leipzig. After the Train-the-Trainer Workshop on eco-driving for trolleybus driving instructors in Salzburg, the event was the second of its kind for ACTUATE. The event was organised subsequent to a training session for driving instructors of tram, light rail and metro drivers by the Academy of the German Association of Public Transport Companies - VDV Academy in Leipzig. In preparation for the trainings, the ACTUATE consortium developed eco-driving training materials, and trained about 30 internal multipliers and started to train all 600 of their tram drivers. The four German external tram companies that participated were: Augsburger Verkehrsgesellschaft mbH (AVG), Städtische Verkehrsbetriebe Zwickau GmbH, Duisburger Verkehrsgesellschaft AG and Stuttgarter Straßenbahnen AG. The participants discussed the eco-driving training concept and materials and exchanged their experiences in the areas of eco-driving techniques and energy-efficiency. Participants identified two main challenges in implementing periodic eco-driving trainings: the lack of adequate on-board measurement equipment for an impact evaluation of the eco-driving training programme, and ways to implement the training within their companies.